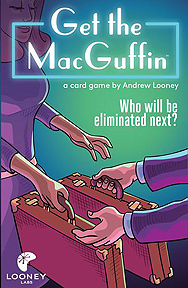 Get the MacGuffin; a quick game where players must make clever use of a limited hand of cards ranging from ridiculously powerful to just ridiculous. A calculated risk might gain you the coveted MacGuffin, but can you hold onto it until the last card is played? Is the MacGuffin even out there at all?